The books reviewed in this article. The astronomy knowledge of our club members is pretty high. One could even say that if we knew half as much as we think we do, that would still be a lot. But we also like to increase our knowledge. To that end we take courses, peruse the net and attend talks. Another educational vehicle is, of course, books. I took it upon myself to check out some astronomy textbooks. 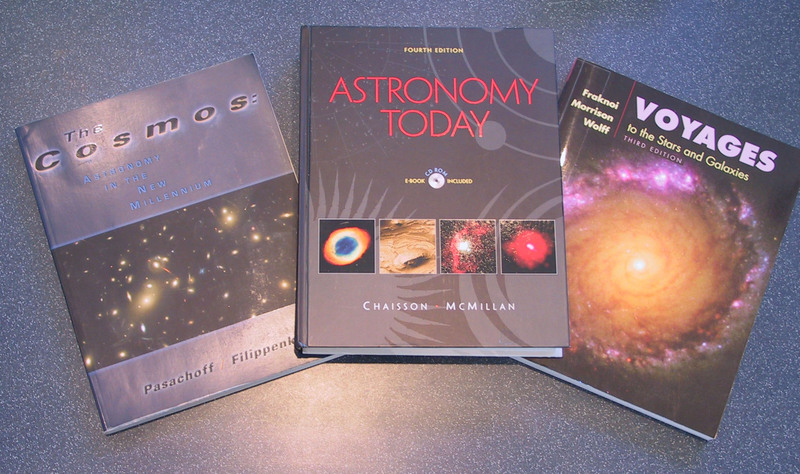 The textbooks reviewed here are Astronomy Today (4th edition; hardcover; ISBN 0130915424; $92 at Amazon) by Eric Chaisson and Steve McMillan (referred to in this article as Chaisson) and The Cosmos: Astronomy in the New Millennium (We review the first edition; the hardcover edition with CD-ROM is $67 from Amazon, ISBN 0534166903) by Jay M. Pasachoff and Alex Filippenko (referred to in this article as Filippenko). We also checked out Voyages to the Stars and Galaxies (paperback; 3rd edition with CD-ROM is $62 at Amazon, ISBN 053439566X) by Andrew Fraknoi et. al. (referred to in this article as Fraknoi) but did not read the entire text so we only mention it in general terms. Astronomers Filippenko and Fraknoi are great friends of the SJAA so a completely unbiased review might not be possible - but we will try. This review will compare these books as reference books. Although we read these cover to cover (just like school, ugh) the amateur astronomer is going to use these books to look things up. This means we are dependent on the Index. We decided to use these books to answer some questions: What is Olbers' paradox and how is it resolved, who is the person that the Chandra X-Ray Observatory is named for, what is the process some stars go through to create nitrogen, who is Jill Tartar, what is a blue moon, what does opposition mean, which occurs more often: a total solar eclipse or an annular eclipse, what is an arcsecond, why does magnitude use positive and negative numbers, where are the Lagrangian points, do any asteroids have moons. We give the result of this hunting later. Both books progress just the way you would expect, basically from the earth out. Both books are generously illustrated and filled with Hubble photographs. Chaisson uses a small version of the electromagnetic spectrum to indicate whether each photo is taken in radio, infrared, visible light, ultraviolet, X-ray or Gamma Rays. However, the description of the picture usually indicates when it is anything other than visible light. Chaisson also uses overlays including a nice version of the Herzsprung-Russell diagram although it doesn't add a lot of information. When reading Chaisson it often seems like the picture that the text refers to is on another page; it actually became annoying after a while. In e-mail conversations with some of the authors, a common theme was that it is possible to give the student too much information. Andy Fraknoi takes the tack that some things have to be taken out of the text so his most recent textbook does not include any mention of Olbers' paradox. Alex Filippenko warns that users can be bogged down in too much detail. Based on these comments and from what I have seen of these books, it is pretty easy to order these books based on total information: Chaisson has the most, Filippenko next, then Fraknoi. You can also just compare the page count: Chaisson: 757 pages before appendices; Filippenko 395. Both books make some attempt to separate the mathematics from the general flow of the discussion. Filippenko does this better. The math is sequestered in sections labeled "Figure It Out". Filippenko also gives more information about the personal side of astronomy, giving some information about present astronomers and what they are working on. Chaisson has distinct advantages for teachers and students. While Filippenko has two types of questions at the end of each chapter, Chaisson has 5. Also, Chaisson gives the answers to two of these sections in the text. Filippenko has some advantages in the appendices which are more complete than Chaisson. Anyone who has heard Alex Filippenko speak will not be surprised to know that his book is a more friendly read. His book includes Peanuts cartoons, a picture of Tiger Woods and a picture of Albert Einstein riding a bike. Neither book mentions Caroline Herschel, one of the first women astronomers. Both books mention Annie Cannon (developer of the spectral classification system we still use) and Henrietta Leavitt (who did the early work on Cepheid variables). Only Chaisson mentions Williamina Fleming and Antonia Maury (stellar spectra studies) while only Filippenko mentions Cecilia Payne and contemporaries such as Carolyn Porco and Sandra Faber. Filippenko's section on Carolyn Porco seems rather prescient given her recent notoriety on the Cassini program. Filippenko does a better job with stellar spectra. The star spectrum for the different star classes are compared better and only Filippenko includes a detailed look comparing ionized calcium and the H-epsilon line of hydrogen. This doesn't represent the detail level of the book in general. So how did the books stack up on the questions. Both books discussed Olbers' paradox but only Filippenko discusses why it is spelled that way and he offers and disproves alternative explanations. Both books will tell you that Chandrasekhar is the inspiration for the Chandra X-Ray Observatory but the index in Chaisson doesn't point to the answer. Both books cover the carbon-nitrogen-oxygen cycle in stars but Chaisson has more diagrams for the more advanced syntheses. Only Filippenko mentions Jill Tartar. Neither book bothers with trying to explain a "blue moon" or an opposition. Only Chaisson says that "roughly half" of all solar eclipses are annular. Although both books use and define "arcseconds", only Chaisson's index points you to it. The books explain magnitude in very similar ways. Only Chaisson discusses the Lagrangian points. Both books have the same picture taken with the Galileo spacecraft that shows a moon around the asteroid Ida. The way I scored this, Chaisson narrowly edges out Filippenko. The edition of Filippenko that we read had a softcover and no CD-ROM. It did contain some star charts inside the front and back covers. Chaisson has a CD-ROM that includes the book and also a program, the SkyChart III, Student Version. Fraknoi has a soft cover and includes a CD that has a version of the popular program The Sky and that gives it the prize for best CD inclusion. All of these books are excellent. A person with little science background would be best off with Fraknoi or possibly Filippenko. Someone who took science each year in high school should go with Filippenko or Chaisson. If you were taking a college astronomy course (not from Filippenko or Fraknoi) and could pick a text you would go with Chaisson because of the larger number of review questions and answers. If you are just trying to teach yourself astronomy, you will like Filippenko best (and pay about $25 less) and that makes it my pick in a very close contest.